Gone are the days of paper boarding passes, appointments with your travel agent, and weeks spent planning a trip. Technology has made the travel booking process much less arduous. . . and it's getting better every day! But with anything that's become easy, there are pitfalls to be aware of. We are either talking to, flying next to, or online chatting with business travelers every day. Here are our tips & tricks - let us know what we're missing! Utilize online search. Flight metasearch engines like kayak.com and hipmunk.com are a perfect place to start your search. They do the work of searching across multiple carriers so you don't have to. We particularly like hipmunk's take on search. Whereas most results are ranked on price, the out-of-the-box thinkers at hipmunk developed an "agony" rating. Results can be sorted by least amount of agony to most, helping travelers avoid the pitfall of making a decision solely based on price. Consider all airports. Most of us are conditioned to search for flights between hub airports only. And most travel search tools follow suit. 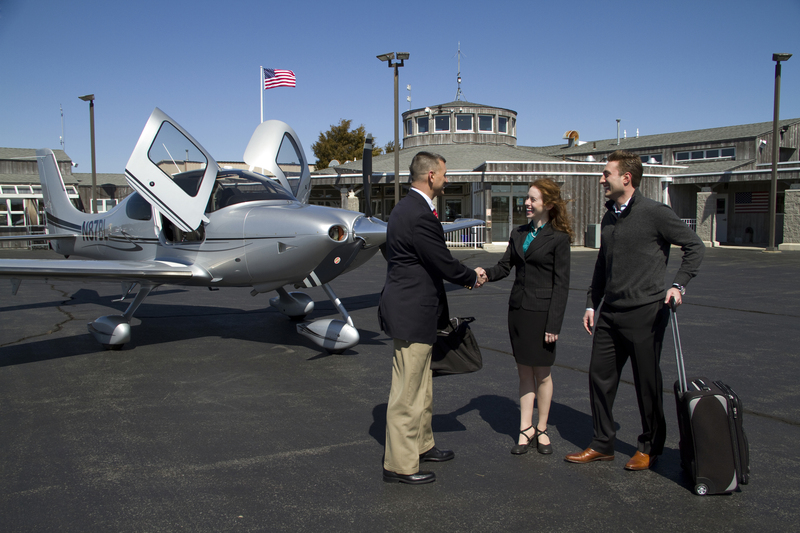 Air Taxi flights, however, can access thousands of regional and executive airports throughout the United States. Look for the nearest airport to your ultimate destination, our online search tool can help, chances are there is a regional airport within miles. Hub airports are typically based in major metropolitan areas which can translate into miles of additional travel once you land, and depending on the city that may add hours of time driving or sitting in traffic. Leave yourself breathing room. Some change policies can be downright draconian. If you are a busy executive with a demanding and unpredictable schedule, like most of our Air Taxi customers, make sure you read the fine print! Sometimes even a minor change can result in a major headache. Find and read recommendations. If you've spent any time reading travel reviews or testimonials you know that travelers tend to have very strong opinions & they're not afraid to share them. Online forums like flyertalk collect reviews on airports, airlines, terminals, miles programs, you name it. Any time you can't find customer ratings & reviews, it's a red flag to us and it should be for you too. Don't leave home without these apps. 51% of travelers worry about flight delays and/or cancellations. * FlightAware provides live flight data, airport delays, weather maps, flight routes and more. Air Taxi customers love that FlightAware tracks both commercial and general aviation flights. Groundlink provides car service throughout the US and internationally. They partner with many esteemed travel companies, including Linear Air. They have a 100% on-time guarantee & you can track your car with their app. Which apps do you rely on when traveling? I'd love to hear your tips & tricks, please comment!